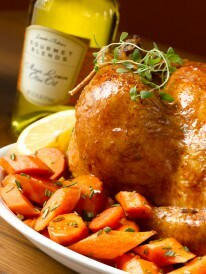 Here is how you can enjoy Roasted Chicken with Meyer Lemon Olive Oil, Garlic and Thyme. Pre-heat oven to 375 degrees.Wash chicken inside and out, dry thoroughly. Cut off wing tips and discard. Place chicken in casserole dish. Season inside of cavity with salt and pepper. Crush 2 garlic cloves and mix into 1/3 cup of Meyer Lemon Olive Oil. Brush cut garlic bulb with Meyer Lemon Olive Oil and place inside cavity along with 1/2 lemon and 1/2 bunch of thyme. Brush chicken liberally with remainder of Meyer Lemon oil/garlic mixture. Strip 10 sprigs of thyme and sprinkle over chicken and season with salt and pepper. With knife tip, puncture skin of chicken in a few places so skin won’t pop during browning. Anchor wings to sides of chicken with tooth picks. Tie legs together. Pour 1/2 cup chicken broth and 1/4 cup wine in bottom of pan. Roast for approximately 1-1/4 hours, basting every 20 minutes or till juices run clear and internal temperature reaches 175 degrees (measure temp. in breast and meaty part of thigh). Slit skin where leg joins body to be sure it’s no longer pink. Remove from oven to cutting board. Discard lemon, garlic bulb and thyme. Cover with foil and let it rest for 15 minutes. Strain pan juices into a sauce pan, skim off fat, add remaining 1/2 cup of broth and boil gently till slightly reduced. If you want thickened sauce, add small amount of flour and stir till blended. Carve chicken and serve w/ sauce. Great w/ mashed potatoes and green vegetable. Serves 2-3. *Variation: Follow recipe using Blood Orange Olive Oil, fresh rosemary (use only 2 sprigs chopped on outside of chicken) and 1/2 orange in place of Meyer Lemon Olive Oil, thyme and 1/2 lemon. This entry was posted in Flavored Olive Oil, Meyer Lemon Olive Oil, Recipes by admin.